Will the Euro survive? Where is the European financial crisis headed? What will it mean for global and US markets? 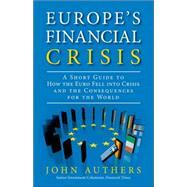 In this short book, internationally respected Financial Times journalist John Authers illuminates today's European financial crisis and the massive forces increasingly buffeting world and US economies. Authers explains why a strong recovery remains far away, why the risk of a disastrous "final" crisis remains terrifyingly real, and how investors can best navigate today's brutally challenging markets. The European Financial Crisis reveals why the 2010/2011 market rallies were so fearful, and why their underlying assumptions -- continued Chinese growth, bailouts, progress towards bank solvency, more easy "Fed" money -- have proven so tenuous. Above all, Authers shows how the Eurozone crisis uncovers today's worst unaddressed risk: the markets' loss of confidence in governments. This brief discussion offers insights into underlying flaws in the banking system and the Eurozone's structure that remain unaddressed; how cheap money and bailouts have bought time that is rapidly running out; and the increasingly frightening signs of "perverse synchronization": forex, equity, credit, and commodity markets massively moving in tandem. He also offers specific recommendations for what policymakers can and must do now to restore the long-term health of the global markets. John Authers, Senior Investment Columnist for the Financial Times, is responsible for the weekly “Long View” and other columns on markets and investment. One of the world’s most influential financial journalists, he has served as global head of the Financial Times “Lex” column, U.S. markets editor, Mexico City bureau chief, and U.S. banking correspondent. Authers speaks worldwide and appears frequently on major U.S. and global media, including the BBC, CNN, MSNBC, NPR, and PBS. He has twice been honored as the U.K.’s Investment Journalist of the Year and was named the Wincott Foundation’s Senior Financial Journalist of the year for 2009, the premier award in British financial journalism. He is author of The Fearful Rise of Markets: Global Bubbles, Synchronized Meltdowns, and How to Prevent Them in the Future, to which this e-book is a sequel. Authers’ previous book, The Victim’s Fortune, coauthored with Richard Wolffe, earned the prestigious Best of Knight-Bagehot Award.